The flat surface conveyor belt is universally used conveyor belt to accomplish different conveying purposes, however 22˚ is the highest angle to which flat conveyor belt is effective, if used to convey the angle above thereof, slips and falls back is common, where chevron conveyor belt is the perfect alternative, is configured by the knowledgeable team of engineers to make every inclined conveying operation successful at cost effective rates. This chevron conveyor belt is manufactured following in depth study of the inclined conveying applications in order to obtain well organized range of the chevron conveyor belt that outperforms at every angle and ensures highest returns on investment. This chevron conveyor belt is composed of the best in class PVC/PU material in order to yield unrivalled quality conveyor belt sharing high tensile strength and durability, whereas the adoption of the proven manufacturing practices ensures that the chevron conveyor belt manufactured to the highest quality. Further, in order to proffer the chevron conveyor belt with the long lasting profiles, hot vulcanization technology is used under the observation of the skilled team of the engineers. The pinpoint accuracy during the vulcanization and expertise enables us to bring off absolutely impeccable range having a potential to surpass customer expectations by delivering an unmatched conveying experience in highly inclined conveying. Furthermore, to ensure the success of the each chevron conveyor belt, it is essential to select the right type and height of profiles, we are in this business for more than 20 years, by which means we are potent to suggest right size and shape for your conveying application and accordingly engineer chevron conveyor belt that prevents following down of the respective material. 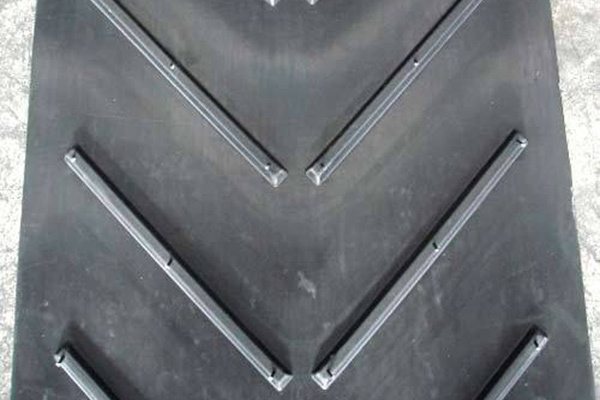 The 8mm, 16mm, 24mm, 36mm is the standard range of our chevron conveyor belt that is all time, available in stock, whereas for another size of requirement, we proffer custom made services, wherein you define specification and we deliver the same in the custom made range, at the most competitive rates in the market. Our chevron conveyor belt is performing unfailingly in hundreds of industries associated with sugar, salt, quarries, cement, grains, vegetables, fruits, wood chips, fertilizer, coal, automobile parts, recycling, sand, and praised for the same.